Beautifully engraved unissued certificate from the Central Transportation Company printed in 1859. 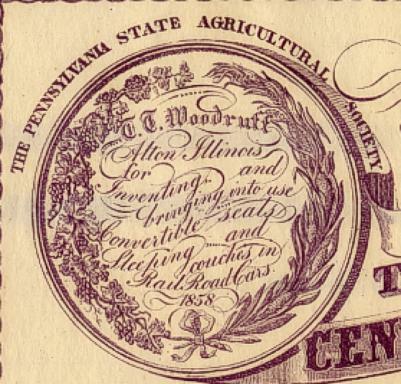 This historic document has an ornate border around it with a vignettes of the Pennsylvania State Agricultural Society Awards for inventing Convertible Seats and Sleeping Couches in Railroad Cars. There is also an underprint of an old railroad sleeping car. This item is over 150 years old. 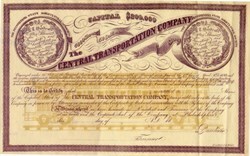 The Central Transportation Company was established in 1862, with Woodruff as the principal stockholder and his brother Jonah (1809-1876) as manager. Woodruff assigned his patents to the new company, as did several other inventors. But in 1864 Woodruff assigned all his interests to one of the other stockholders and retired from the sleeping car business. In 1870, Central Transportation became involved with Pullman in a patent infringement suit and after costly litigation was leased to, and assigned most of its patent rights to, the Pullmans Palace Car Company. Theodore Woodruff�s brother Jonah decided to begin again and organize his own line. He had been involved in sleeping car design and had acquired several patents of his own. His new company -- the Woodruff Sleeping & Parlor Coach Co. -- was expanding nicely when his health gave way in the mid-1870s, and he died in 1876.